Presenting the Word of God as a unified Jewish book, The Complete Jewish Bible is a translation for Jews and non-Jews alike. It connects with the Jewishness of the Messiah, and non-Jews with their Jewish roots. Names and key terms are returned to their original Hebrew and presented in easy-to-understand transliterations, enabling the reader to pronounce them the way Yeshua (Jesus) did! The New Testament was also written by Jews, initially for Jews. Its central figure was a Jew. His followers were all Jews. This translation uniquely communicates its original, essential Jewishness. Esword is the perfect study tool, I use Esword most days. 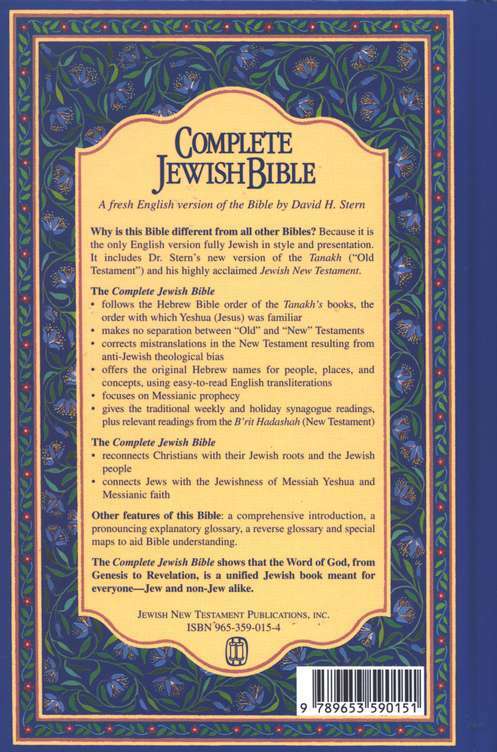 The JCB (Complete Jewish Bible) is a bible that every believer in Yeshua (Jesus) should have in their collection. This Bible uses the proper Hebrew names of the people and places. 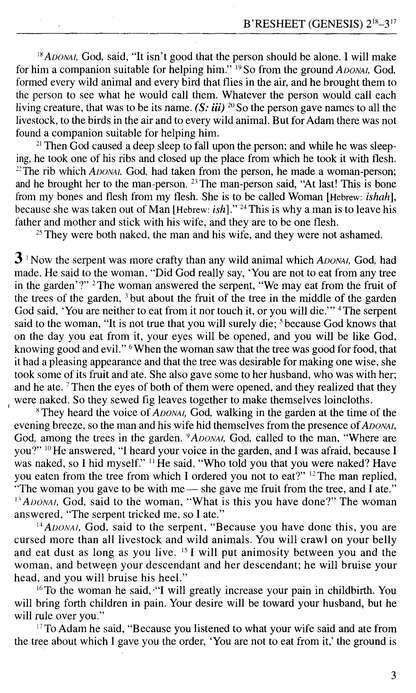 e-Sword is by far the best Bible program available today. For any level of study.The CJB adds a new level of understanding to Scripture for me. First time purchase, was a little worried about the process... simple and easy to use. Worked easily with E-Sword and am enjoying. Download into eSword was flawless. This version has become our new goto version over the King James, which had been our trusted source for several decades, For example, the CJB translation regarding Isaiah 59:18-19 was prophetically enlightening. We are so glad we made this purchase. If you are Hebrew Roots and studying Torah, this version will help immensely. Out of all the scriptures I have read and studied from, the CJB is the best. This scripture is from the Hebrew perspecdtive and not from the Catholic sources including the KJV. Dr. Stern has done a wonderful job in creating this scripture. Remember, it's a one-man translation and comes with his textual biases glaringly evident. If you are okay with that--and I am, since I correct on the fly--then have at it. If you don't know the difference between aleph and alpha, or you depend on whomever you are using for your insight, then be careful. Be very careful. Want more truth in a translation from the Greek original? Ever wonder why most of the Jews in the new covenant are given gentile names? Anyone wonder when Saul changed his name to Paul you can find the event in the book of Acts and it happens like this "also known as Paul" and is then Paul in other translations but you get more truth in this translation, not prefect but much better, so one step at a time until the deceivers are in the rear view mirror. HALLELUYAH!! HALLELUYAH! HALLELU YAH! We have used this bible for years. It is a great tool for a deeper insight into the Hebrew understanding of the scriptures. After all, even the "new testament" was written by Jewish people! As a student and teacher of GOD'S Living Word, The Complete Jewish Bible for e-Sword compliments my library of necessary materials in seeking out the GOD of the Israelite's and my GOD as a Gentile. The Complete Jewish Bible brings to light a greater understanding of who my Creator GOD is. Whether you are an occasional reader or a very serious seeker who desires a deeper, intimate walk with JESUS this Bible is a must. Thank you for asking, Respectfully ----- Donna. I have downloaded the Complete Jewish Bible and am thoroughly enjoying it. This Bible opens scripture up so much - passages that had me scratching my head trying to fully understand it, now is much clearer in this Bible. My husband and I love e-Sword and do our best to spread the word of the work you are doing in the name of the Lord. With the addition of eStudy this is a great package. Well done, and we hope God richly blesses you. I love this version because it leave the Jewishness of the Bible intact without any antisemtic translations. I am enjoying the version in e-Sword for my daily study. I love the app to do bible study wherever I am at any time. It brings joy to read and study Gid’s Word. A great addition to my Bible collection. I have the Complete Jewish Bible in hard copy and this addition to E-Sword makes my studies so much more interesting from a Jewish perspective. Helps deepen my understanding of the bible. Appreciation for the Jewish roots of my beliefs. As with all e-sword products it links well into the software. This bible uses Hebrew (English spelt & pronounced) names for people and places. This means I take more notice of what the scripture is saying because I do not skip over or take words for granted. Having e-sword helps me as I am very visually impaired so my pc can read it to me. I am very pleased with this translation. I have a better understanding of what God is saying. Very clear and in common language. I am also interested in Jewish thought on the Scriptures. It is the easiest version I have come across. Very easy to understand and read. The product is as good as described in the advertisement. I have 16 Bible versions on my eSword but this is the one I use almost all the time. I have it for another PC laptop (separate purchase) and on my iMac. I could probably count on one hand the number of errors in the CJB that I've found but translating the Scriptures is not an exact science and Dr. Stern has done an amazing job overall. It's easy to read, will help you learn some Hebrew (transliterated), and you don't hear the people speaking in an old English accent in your head. :) I have four hard copies of the CJB as well as the CJB New Testament audio version (no OT yet). Bless you for making this amazing tool available!! The Jewish bible takes us back to the very roots of our Christian heritage, reminding us the stump of Jesse, the shoot growing from it, and our dependence on a Jewish Christ... The text turns us back to a middle eastern understanding, our mirror for reflection the gospel as it was written. This is a brilliant resource. The words the way Yeshua would say them. Brings the bible to life using the original language. It's brought me closer to YHWH and closer to Yeshua. I wanted to try a new version to mix things up a bit in my regular reading because I felt I was missing some cultural depth. 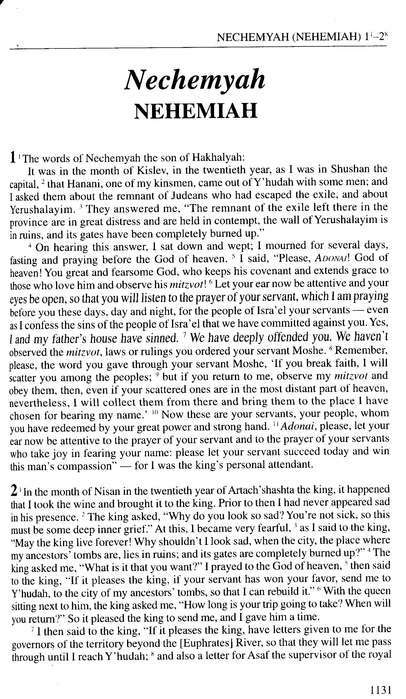 I have learned new insights daily reading this version which gives a Jewish perspective. Especially helpful is looking at it in Parallel. I was already using the Complete Jewish Bible as an alternate translation in my studies. Since I use eSword quite a bit, it just made sense to go ahead and purchase the electronic version for my usage in eSword. The only thing missing is the real name of God where Adonai is used. It is like we are making the same mistake the prophet warned the ancient Hebrews about; forgetting Jehovah's name. The Complete Jewish Bible is a brilliant addition to the Bibles available on e-Sword and is a must have for all serious Bible students. I have found it most helpful to compare this Bible with others when I am studying the scriptures as it gives a great understanding of the words from a Jewish perspective. If I was downloading for the first time, knowing what I now know it would be the second Bible i downloaded. I have been studying the Torah now for 3 years and having this translation has been extremely helpful in my studies. The process for downloading was simple and quick. Thank you! This is a translation that every Pastor should have in his arsenal. This translation comes from a Jewish mindset, making many unclear passages jump out with amazing clarity. I highly recommend the commentaries by the translator, Dr. David Stern as well. Amazing. 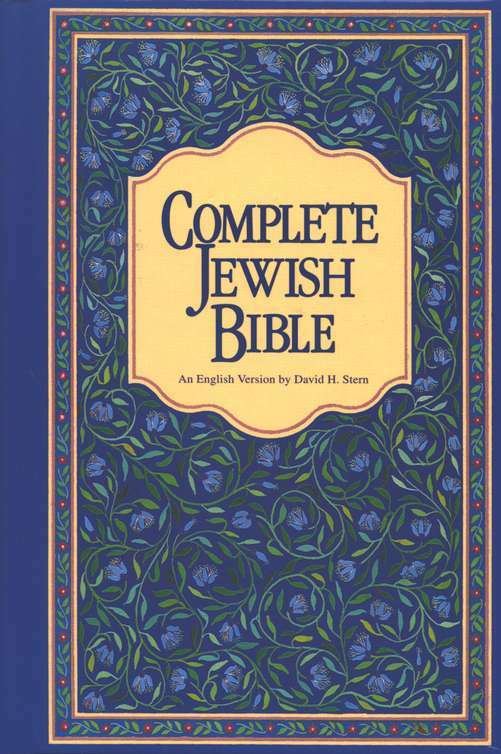 It's complete, it's Jewish and it's a bible! Seriously though it's written in plain and simple language that even I can understand. No inconsistencies I've noticed as of yet. I usually parallel with the AMP bible before going deeper, makes it easier when Jewish names I'm not familiar with yet pop up. All in all a very good translation that I use everyday. Love it! I wanted The Complete Jewish Bible and as I still have trouble finding my way around the Bible, I have since found that getting as an electronic bible it really is great. It's easy to use and find my way around, I would highly recommend it for anyone that likes electronic devices. I use it as a secondary source for comparison with a mainline translation such as NIV or ESV. When there is a difference, I'd do further research and see if there is some insight. For example, Luke 2:7, "inn" is translated "living-quarters", indicating Joseph and Mary may be staying in someone's house. I plan to read through the NT of this version this year. Very pleased, helps to clarify the original meaning. Minimizing translation implications. This is an easy to read and understand version, I have it in a hard copy and yes I often use it in Preaching. I am so happy to have this translation on e-sword. I believe it is the best one to study the Hebrew words that were spoken in that time. I also have a leather bound Complete Jewish Bible of my own that I read daily and now to have it in this study format makes me very happy. "Adonai appeared to Avram and said" Sometimes when I read the familiar Bible names... their story unfolds in an instance...Reading "Adonai" or "Avram" has focused by brain with renewed hunger for God's Love Story. It is a real blessing to read the bible with the original words spoken or written on those great and anointed days of scripting what the Holy Spirit gave to the writers of the Holy Book. I am greatly touched. Thanks to e-Sword for making all these treasures available to us. This is the translation I've been waiting for. It has the readability of the New Living with the cultural integrity of the Jerusalem Bible. It just makes sense to me to understand the original culture from which the Gospel emanated. By reverting back to the original Hebrew and Aramaic names, it brings it closer to the original culture in which this phenomenal event was spawned. There is power in the Name! I love this Bible. I love spending hours working with e-Sword and use it to grow as a Christian and to prepare lessons as a teacher of children as well as adults. Every resource is at my finger tips and the CJB has greatly enriched my knowledge of God's Holy Word as well as increasing my faith. I feel the CJB sheds more light on Jewish customs, prospective and language. I am finding this source to be an excellent aid to interpreting scripture. Yes I like The complete Jewish Bible on esword however I purchased it so that I could read the weekly Torah portion. What I found out is you can only access Bible Chapter and verse. 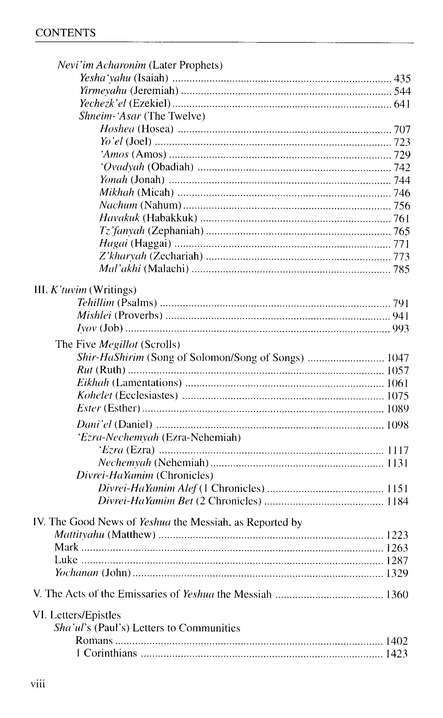 I am putting the whole years Torah portions under topic notes, and will just look at them for reference unless I figure how to link it to the correct chapter and verse. 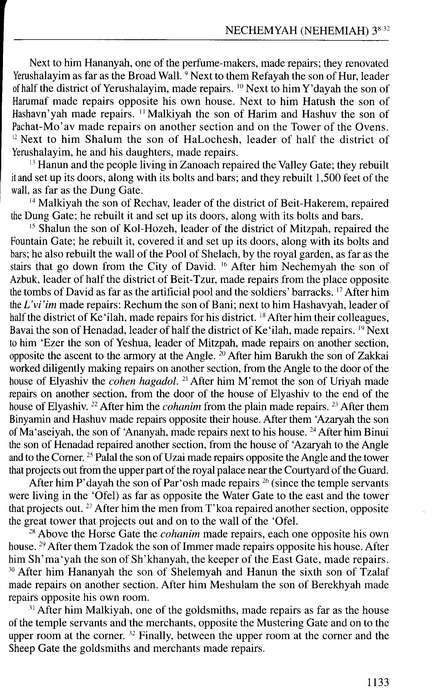 The Complete Jewish Bible restores the actual Hebrew names for people in the bible, along with the names of actual places such as Beit-Lechem (Bethlehem)house of bread. If you are interested in discovering your Jewish roots of the Christian faith, this bible will help you understand the Hebrew language a little more. You will need to use the dictionaries and the glossary that comes with the bible, and after some study you'll be amazed at how much more understanding of our faiths roots you have.
? Mmm. How can I put this.... Personally this translation has been better than any commentary I've read. I believe that Dr. Stern's translation embodies the character and Spirit of God's written Word. Every person that I have shared this with has smiled and asked where I got this. They love it. My mom who has been walking with the Lord for over 45 years cried and she read some of her favorite passages. It very accurate and has become the translation that I read and study from. If you enjoy reading and studying the Bible then get this Jewish translation and see for yourself. "Heb 4:12 See, the Word of God is alive! It is at work and is sharper than any double-edged sword — it cuts right through to where soul meets spirit and joints meet marrow, and it is quick to judge the inner reflections and attitudes of the heart. Heb 4:13 Before God, nothing created is hidden, but all things are naked and open to the eyes of him to whom we must render an account." 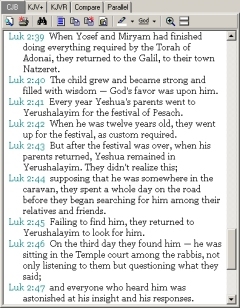 The Complete Jewish Bible for e-Sword is one of the latest additions I've made to my E-sword software. 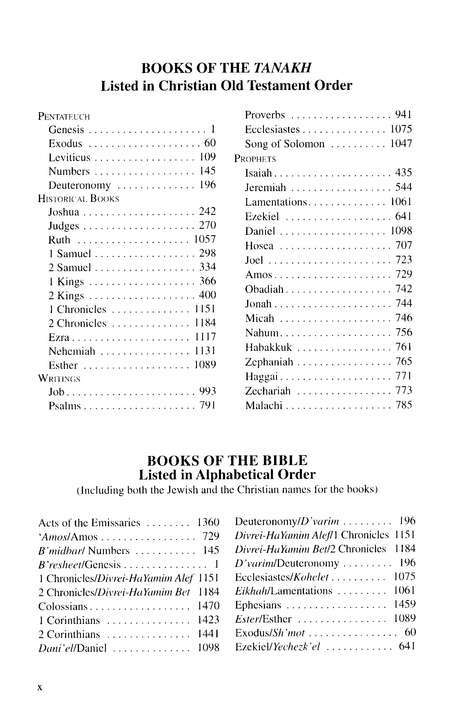 I have in all, 54 different versions of the Bible, 50 of which are in my E-sword software. Along with 17 different Bible dictionaries, and 22 different commetaries, and yes I do use them all. The Complete Jewish Bible for e-Sword offers a slightly different perspective on many things that the Christian only angle often doesn't offer. It's a good asset and resource to have available to me when I do my studies. I was very happy with the fast down load of the Complete Jewish Bible. I have not used E-Sword enough to find all the things I want to learn to use as yet. I am very excited about using it to take my notes, research and find bible verses much faster. I hope to start writing articles in the future, one will be "The blessings from Trials". Thank-you with all my heart for the creation of E-sword, You are definitely a doer of the Word. May God continue to bless you with the ability to continue helping others in the use of this software to increase their learning and gaining wisdom in Gods work. This product is a necessary addition to my e-sword package. Since we are worshiping a savior who was born into a Jewish family, it is essential to understand as much about his background as possible. The complete Jewish bible achieves this. And having it in the e-sword package on my computer, it integrates well with the various English translations. I bought the Jewish New Testament (paperback version) by Mr. Stern and we used it for our Children's Fellowship because the translation was so clear and well-written. I've found the Old Testament in this electronic version every bit as good - the fact that both Testaments are translated from the Hebrew make them exceptional in terms of accuracy as well as clarity. I would recommend this version of the Bible to anyone and everyone, especially for those who have trouble with understanding the King James English. The Complete Jewish Bible not only gives the Hebrew names as originally written, but because of its source, has (in my opinion) greater accuracy than anything taken from the Latin and/or Greek, both of which were themselves translated from Hebrew. Why not use the actual source of God's words? Beautiful book, written with heart. Worth it at any price. I had friend in Vancouver, a Messianic Jew, who spoke about the New Testament in a way that breathed life into it. I experienced the same feeling as I read the Christmas story in the Complete Jewish Bible. Don't overlook the pronunciation guide that comes with it. My parents came from a Christian background but we weren't as faithful as we could be. My religious training was almost non-existent. E-Sword has afforded me the opportunity to compare various versions and interpretations of the Scriptures. I am also looking at or for denominational differences and their causes. I am so thankful that E-Sword was developed and that it offers all that I can imagine. It's a brilliant bible - thanks. Since working on and with E-sword program I have had tremendous pleasure as a missionary doctor het in a remote area of South Africa where it is quite difficult to share problems and find answers from other brothers or sisters who are "on the WaY" (Acts 9:2) with Jesus. The Complete Jewish Bible and KJV with Strong's gives a lot of insight. Thank you for a wonderful privilege. I'm very happy to be able to include the Complete Jewish Bible in my eSword study program, as it gives me a translation from a Jewish point of view about the events surrounding Jesus' life, and his history. Being able to include this version on my iPad is a great benefit to me, as I travel and study. I've used CJB for several years now but I finally got the e-Sword version on my laptop and on my iPad. I really love the portability of having it on my iPad. For those new to CJB, Hebrew names and locations are a bit different but easy to adapt to. It's nice to have another translation to compare to at my fingertips. It's also a great price! Though it takes some getting used to, if you have a great fear & reverence of our Heavenly Father, you'll really enjoy this translation; especially for parallel studies. Stern's CJB is a great reference for Messianics, or Hebrew Roots people who want to get closer to the 1st Century faith. No more greek Jesus, but Yeshua the Lion of the Tribe of Judah! This work helps clear up the misconceptions of Sha'uls's writings (Paul), and thouroughly grounds the new testament writings in their Torah source. excellent, a great help to find the original Hebrew text and meaning. I like this version very much, especially since it gives the original name of our Savior, Yeshua, as the Angel commanded Yosef in Mathew 1:21. Furthermore, it also shows clearly that Yeshua is the express image of the Father - Yahweh in the flesh, called Adonai in Exodus 3:15; John 1:23; Mark 12:29-30...; and why Yeshua could say: John 10:30 “I and my Father are one“. John 6:46 “Not that anyone has seen the Father except the one who is from God — he has seen the Father”; John 14:9 Yeshua replied to him, "Have I been with you so long without your knowing me, Philip? Whoever has seen me has seen the Father; so how can you say, 'Show us the Father?”). So, Yahweh could say to Yahweh/Yeshua: “sit at my right hand”. It's a brain twister, and I can understand why the Jews were ready to stone Yeshua for blasphemy. Our pea-brains can't really understand Eloheem' unless He reveals Himself? Every member of JW should own and read this version! Very interesting to read from a Jewish perspective. You have to get used to a change in names, but that is really minor. Some things are better translated, being literal word-accurate. Extremely enjoyable to read and study from. Gives light on many scriptures and I feel an intimacy with God's Word that i haven't noticed or felt before. E-sword is a great program. Downloads that are controlled by e-sword are quick and easy. The Complete Jewish Bible is another translation that one can use for Bible study. It is disappointing that in some instances the author defers to rabbinic teaching (Exodus 23:19, Exodus 34"26 and Deut 14:21), translating "gedi" as "young animal" instead of "young goat", but over-all it is as good of a translation as NIV. The CJB shows insight in Jewish historical context. As a disabled person, e-Sword has proven to be a tremendously valuable tool and help in my studies. Interestingly, it seems that everybody I tell about e-Sword, ends up downloading and using it. Thanks and blessings to you! What fun. I began in Genesis, and it was like eavesdropping on old Jewish men talking about what happened at the beginning. As I read, I'm listening to an almost light-hearted explanation of each of God's six work days, and after each is added, "and that is how it was." There are many turns of the phrase just different enough from what you're used to reading that it invites new reflection. Proper nouns are given in Hebrew, often with their meanings in parentheses, and that,too, gives pause for reflection. And just when you start to speedread because you think you know this stuff, a new word appears to slow you down. 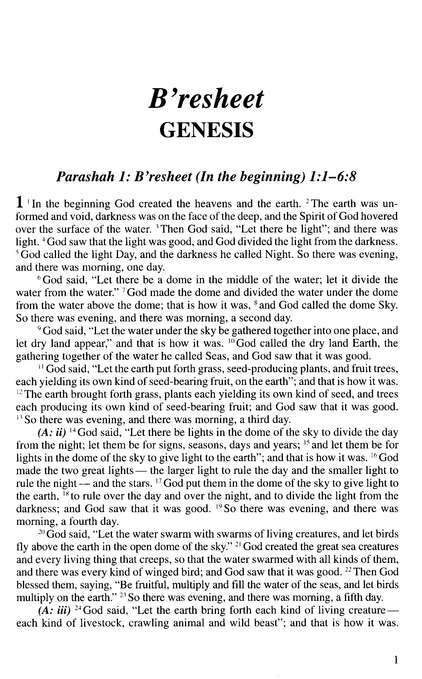 For example when God said, "Let there be lights in the dome of the sky to divide the day from the night," the word "dome" was new to me, so I looked it up to see how it related to firmament/arch/sky. Things may not be so light-hearted when I get to Leviticus, but I am finding this a wonderfully refreshing way to read Bible passages you've read before, and I'm happy to have it. Very good, an easy to read and understand. Enjoy the Hebrew names of people and places. A good addition to my e.sword experience. I have owned Dr. Stern's Complete Jewish Bible on paper for several years now and I will now be using it extensively in e-sword as well. I highly recommend this translation to help the reader hear what the original Jewish audience heard when Jesus (Yeshua) was teaching as well as Paul (Shaul)and the other apostles. Having the Tanakh with the personal names are they are pronounced in Hebrew is, to me, very helpful. I love this translation. My family and I are reading the bible, cover to cover, this year. This resource is an excellent one, as it bridges a linguistic gap, that exists between Christianity and the original Judaistic (beliefs/customs/word usage) of our Lord and Savior, Yeshua. I found this version excellent and have already begun to understand more clearly as I have examined verses against other translations. One new key of understanding opens the doors of God's Treasures and helps us get excited about the Word and learning all over. Every Key opens a new door to wisdom and I know much wisdom will be gained by this translation. Excellent study source for those who wish to study the Scriptures through the Hebraic lense. I use this Bible in a Torah Class I teach as it helps new students to find their way around in the arrangement of the Hebrew Tanach versus the Christian Bible. I also like the fact that it is one continuous work rather than two separate covenants. The pagination is continuous even in the New Covenant to show the connectivity of the covenants as spoken of by the Prophet Jeremiah. I Purchased the CJB June 2010 and thoroughly satisfied with it. I have the hard copy too! But I love it with my E-Sword! Thank you! I'm a bi-vocational pastor which means I have to manage my time wisely. I can get on my laptap on my lunch at work, and work on sermons or bible studies. The e-sword bible software gives me access to bible translations, word studies, commentaries,etc, at a very affordable price. This is a blessing for the busy bi-vocational pastor on a tight budget. It doesn't take up all the hard drive space like some of the other bible softwares and it's user friendly. I look forward to using more e-sowrd products in my ministry. Thank you for the service you give to the Body of Christ.Aaron Johnson. I have enjoyed the CJB translation for sometime but I am new to the eSword product. I was glad to see that the CJB was available for eSword. I do miss the notes within the text that indicate information about the Torah portion boundaries. Perhaps this will become a feature added later. The CJB installed without issue and seems to be very well integrated into eSword. Thanks for providing this product. 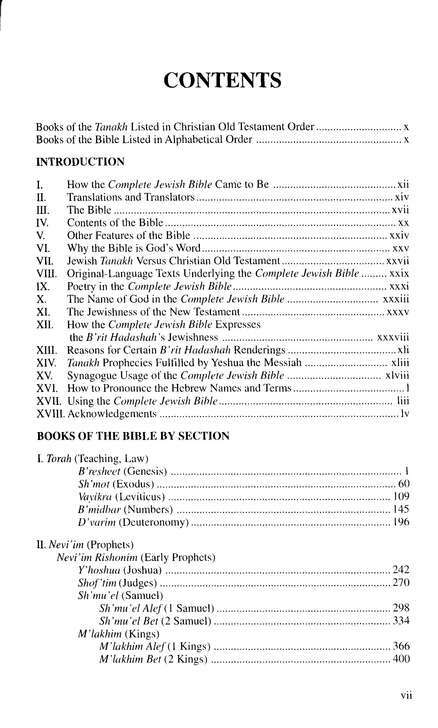 The Complete Jewish Bible brings a better understanding of other versions, such as KJV, NIV,etc. The New Testament in a jewish perspective. A wonderful addition to anyone who seeks to reach a better knowledge of the scriptures. I love this along with the Hebrew downloads, its helping me learn the language. I like to use several Scripture versions when I study and this one adds so much to the understanding of the original words and cultural nuances. I highly recommend it. I have had e-sword with many translations and commentaries for a couple years now, including The Complete Jewish Bible. I just recently bought The Complete Jewish Bible for my laptop because I like taking it to the Torah study on Sabbath. Just wish I could get The Jewish New Testament Commentary on e-sword. Thanks so much for these resources. God Bless You. A favorite translation and one that focuses on Hebraic thought. Very useful to me in comparitive references. I wished there are words to express my excitement, I am so hungry, this is so great, I can hardly believe I have it now. If you are serious and want to learn more,this is it! I love it and I am truly enjoying digging into God's Word every day. Thank You for making it available. I recommend this Bible to everyone. This Complete Jewish Bible helps the reader to connect with the cultural, historical and religious understanding of the Jewish people. Through it, we can come to see the Word of God in a context that helps connect us to the people who came to know the Mighty God millenia ago. The reader can also achieve a laymans understanding of the meaning of some words that have been interpreted with perhaps different nuances than originally intended. I find this to be an invaluable resource, it has become an important part of my personal Bible study and has helped me to delve deeper into the words that out Heavenly Father has passed on to us to aid us in our faith-walk. Those who are searching for information on the Bible for historical, cultural or scientific understanding will also gain much through using the Complete Jewish Bible. I am amazed at the depth of the resources that are now available for e-Sword. One of the features I like best is the ability to quickly and easily compare any versions or translations I choose. In addition, e-Sword has made referencing various concordances, dictionaries and commentaries as easy as the click of a mouse. I especially like that I can choose any number of translations and incorporate them into my study. 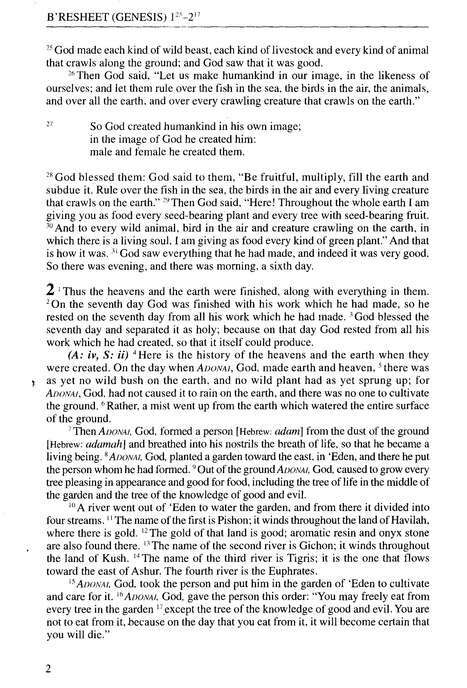 I cannot begin to tell you how pleased I was when I saw that you have this Bible on e-Sword as I have a Yeshiva in S A and this is the best Bible to use for the teaching of the Hebrew Roots. Be blessed in all that you do. Overall satisfied with the purchase. Very easy to install. Installed first time. Used product key from email, typed it in, and I was ready to commence studying. Will recomend to friends. I have read a great deal of passages from this version and I think that it is a well translated version of the Hebrew Scriptures. I believe that it was written especially for my orthodox Jewish ancestors more than the gentiles. If you are looking for a transliterated version, then I think The Scriptures would be the better version. I have studied the Hebrew language and I am learning to translate the Hebrew into English and I prefer The Scriptures over The Complete Jewish Bible for myself. I am a Hebrew biologically and by faith a Messianic Jew. Both Versions are written for the Messianic Jew but again The Scriptures is the better version for accuracy. The two ultimate translations are The Scriptures and the King James versions by far. Well, enough said about that, I hope that this review will help someone choose the right version for themselves. e-Sword coupled with this Hebrew perspective of Yeshua's Word has opened many many doors and shed light in areas of YHVH's spoken and living Word that I believe no other translation has been able to do - The use of the names of the Creator in their true form instead of the blanket use of "LORD" greatly clarifies areas of study that the King James version and others of the like have not been able to do in the past. Whether we claim to be Catholic , Protestant , Messianic Hebrew or the blanket name of Christian, we all are seeking to worship and obey the GOD of the Hebrews (Defined - those that have crossed over). Its time to cross over. In these days when nations come against Israel and so much of the "church" is led astray in replacement theology, it is essential to understand the Hebrew mindset and culture. The Complete Jewish Bible goes a long way to help us achieve true context. Thank you to those who have made this possible. 31 years ago I found that God knows me and I began to want to know Him. As the Holy Spirit enabled, I began even to understand the Authorised King James Version of the Bible, which had always been "closed" to me. Then I was blessed with a NIV Study Bible and understanding began to flood.&nbsp;Years later, as I became 'bolder' in my use of a computer, I discovered e-Sword! Hallelujah! King James, Amplified, The Message, Matthew Henry's Commentary, Albert Barnes' Commentary - all tore away the "frame" within which my relationship with God and my fellows had been confined. Then I experienced that 'thing' that computers do best, CRASH! So I lost my Amplified, my only cash purchase up to that time.&nbsp;Starting again and wanting to load another Amplified, I 'found' the "Complete Jewish Bible". Fascinated, I bought it instead and found it to be a wonderful Door, opening into vistas of insight that I had not even hoped for! What a blessing, often to suddenly find an affirmatory, new understanding of the phrase that I'm reading - never 'totally new' but always 'strengthening' of that which I already understand. It's as if Jesus, in the Holy Spirit, wants me to KNOW that He always has better things to discover in that which I think I have already fully explored.&nbsp;Recently, a virus destroyed my computer again. My first purchase, after loading e-Sword to the new Laptop, was another CJB.&nbsp;Thanks to Adonai, Yeshua, the Ruach HaKodesh and Rick-His-servant, for the blessing of understanding, Amen!